I can’t tell you how psyched I was to find this footage of Dave Graham climbing Psychedelic courtesy of Korea’s version of Youtube – Actually courtesy of either Smackmag or climbXmedia from what I remember. They had an awesome 3 pack of Graham climbing this route, Necessary Evil and Breakin’ The Law if my memory serves me right (it has been 7 years). Noticing a pattern here?? When you consider these two incredibly short lists and compare them with the incredible number of hard routes being established and repeated in Europe it raises a lot of questions. Are sport climbers in Europe that much better? Is there that much more quality rock in Europe that lends itself to hard routes? Are the crags in Europe that have hard routes just more accessible than cliffs like The Fortress or Clark Mt. in the U.S.? Is the fact that most strong U.S. climbers prefer to boulder a sign of laziness…or something else? What does everyone think? Isn’t “The Fly” at Rumney rated 14d? It was put up by Graham and repeated by Lamiche I believe. And I heard that Jason Kehl bouldered it out since it is only about 40 feet high and the crux is in the first three moves or so. Maybe this is neither a route or a boulder problem, but it probably deserves mention somewhere. There is video of Lamiche on it somewhere out there and it looks like he has the first two bolts pre-clipped seems like it is nearly a toprope this way (since i don’t remember him clipping any more bolts before the anchor). if you don’t pre-clip the first two you might as well just solo/highball it. plus, if i’m not mistaken, those clips would be nigh impossible. I am pretty sure Mr. Graham stick-clipped the first bolt then slipped the second one on lead. That is the Rumney lore. There is a Prana advertisement in the old Rumney guide that shows Graham climbing the route with only one bolt clipped too. Yay minutia . I’m a little unsure about where to include the fly with respect to the style of its ascent as well as its grade. I should probably put it on one of the lists though. for completeness, luke parady and sharma also climbed the fly. 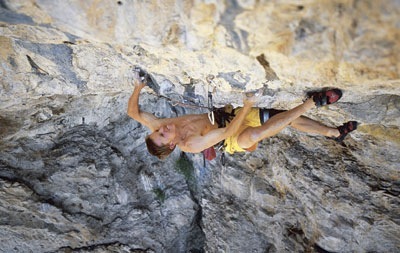 and on 8a.nu, christophe maschelein too (as well as other hard boulder problems. from his scorecard, it also sounds as if he also bouldered the fly). i know nothing about him though. can anyone help out? I’ll put the Fly on here I guess. I’m not really 100% on the list of repeats though. Also, I don’t believe anyone has climbed it without the first 2 draws pre-clipped with the exception of Kehl who bouldered it. When I tried the fly I didn’t boulder it or preclip it. There is a ladder right next to it and yo can touch all the “Holds” as you pass them. Thats how I roll. I think in the next couple of years with the “weak” American dollar we should see an influx of euro climbers then we will see what they are made of. I know that when I have climbed over seas I have gotten some of my hardest red points. what does this mean??? I don’t know. But I shall wait for the narcs take on it. DG moved the fly to be an 8B+ boulder on hid 8a card, noting that he used a rope and registering it as a TR ascent. given the fact that he did the FA, I would be inclined to defer to his discretion and count it as among the hardest boulders in America. everybody knows the gravity is weaker in Europe. has something to do with the location of the Prime Meridian, and the erroneous signification of soccer as ‘futbol’. i only climb in the America: where we have ‘real’ gravity. i would like to make an offer to purchase the screen name “hardforgrades” used by a poster on b3bouldering.com. while admittedly gross, this cracks me up to high levels. final note: if anyone can clip on lead, expecially the coveted and elusive mid-deadpoint clip, i say give em 5.15b for it. when climbing highballs in the boot of doom last summer, i practiced a few on self-belay TR and found that when climbing ropeless, even in a boot, it was at least a full v-grade easier [or more]. to boost the v grade of my best sends, i plan on repeating them with top rope self belay tactics. and a beer in my chalk bag. Peter – has anyone besides Kehl climbed it without a rope? i tihnk you should change it to 8c+ and up. Then the list would actually be a normal length. as for the reasons, theres just not enough people syked on hard routes in the US. In Spain and France theres a group of maybe 50 people going around and climbing and establishing new 5.14s all the time. In the US its the same thing except with V12 and harder boulders. Different places, different environments, different sykes. Gabor – you are probably right and that is something I may do in the near future. However, a similar list in Europe would probably be exponentially longer. Also, my knowledge of route info is decidely not as complete as my boulder knowledge. Not quite sure about the grade but Livin’ Astroglide at Rumney checks in at either 14c or 14c/d. Its an extension to Graham’s Livin’ Astro redpointed by Joey Kinder. I don’t think that anyone besides Kehl has repeated the Fly sans rope. It seems plausible that Kevin Jorgeson or Ethan Pringle may try at some point, though. My point was not that it’s attracted more attention as a BP but rather that once Kehl “soloed” / bouldered the route DG retroactively moved the Fly from a route to a boulder problem on his scorecard. In doing this, DG suggested that by not TR’ing what should be a boulder problem, Kehl indeed did it in a better, or at least a more pure, form than the way in which he had done it. Most definitely Peter. Kehl’s ascent certainly set the bar for future repeats to be done sans rope. He proved that it could safely be climbed without a rope. Add in the fact that the other ascents were basically done on TR and I guess you could make a good argument for it to be counted as a boulder problem. As an aside, Ty Landman was trying ‘The Fly’ last year as well and I think he used a rope. In the long run it doesn’t really matter where it is included though I guess. Either way it is super difficult. With regard to the grade, it is notable that Kehl did it and he is not really known for climbing many (any?) V13s or any V14s that I am aware of. This article http://www.ukclimbing.com/articles/page.php?id=854 gives a good idea of the quality of crags available virtually roadside in Spain. It’s the same in France too, in areas like Gorges Du Tarn there’s amazing cliffs that haven’t been climbed on at all because they’re more than 20 minutes walk from the road. Thanks for the article Tim, that was a great write-up! It does seem as though most futuristic sport crags in the U.S. require incredible amounts of effort just to get to them, let alone equip and work projects. Exactly – If Fortress of Solitude and Clarke Mountain were both 10 minute hikes I’m sure they would have seen more action and even some repeats. It still seems pretty crazy that the number of routes in the grade range here in the little old UK is comparable to that in the U.S! Yeah, if they had the approach hike of Rifle things would be a bit different. It is especially amazing when you consider the weather at these U.S. crags compared to the weather at UK crags! Kehl has climbed a bunch of v12’s (or basically 5.13d’s?) including Evilution and Straight outta squampton, so he definitely has the head for a death landing. He made the first ascent of the unrepeated “The New Zero” at the holy boulders in Southern illinois, speculating that it might be around v13. Subsequent access issues suggest that this grade might always be in question. He’s also climbed Black Lung, which is speculated to be around v12/13. I believe he also made the second ascent of Lamiche’s “The Shield” (hard v12) in LRC during Sportiva’s solution team tour.Basically, I can see how Kehl, in good shape, on the right problem for him, could climb v14. I am from the Rumney area and have gone up to it to stare in awe. Imagine Jade like holds, (Woods RMNP) and then try and clip off them. impossible at the moment. So you have two choices TR or boulder. It cant be classified as a sport route since you cant clip it as a normal redpoint, unless some new phenom wants to try. Its a scary as hell boulder is what I would say and for some it isnt worth broken bones since the landing is a jumble of granite blocs and moss. by the way, i love the ladder next to it. makes us all feel so weak. I think Ghetto Booty is supposed to be 14.b. Maybe the reason is the traditional American style/ethic of ground up ascents and the stigma of rap-bolting in many crags. The European style is a bit more permissive (head-point, rap-bolt, via-ferrata…) but without that style we wouldn’t get to discuss how freakishly strong those damn Europeans are. The number of hard routes expands alot if you include 14c. A lot more of these could be unrepeated. How hard do you have to climb before you use French grades? Unforgivable 14c DW Where is the Wailing Wall/Welcome Springs? I think it would probably be a good idea to keep up this list and add to it as necessary if you are going to do the same thing with the bouldering one. I would be curious to see how well we could curate an “open projects of suspected 5.14d+ difficulty” in America. We have seen very little progress in the Northeast towards a route of this difficulty being completed – the Bill Clinton project to the left of Jaws II and Super Fly (which might be a joke in terms of actually being possible) to the left of The Fly at Rumney being two possible contenders. The Dalai Lama project at Farley has also been speculated to be of world-class difficulty, though I have heard the individual moves were all done by Vasya and it is just the clipping-of-draws-on-a-40ft-compression-roof thing that has prevented it from going down. Unfortunately, with the possible exceptions of Pete Kamitses and the newly uncovered Andrew Palmer, anybody who climbs that hard in our area ultimately migrates West. I’m sure that between the massive quantities of rock in the Adirondacks and White Mountains, an enterprising crusher could bring quite a few more routes of that difficulty to the East Coast; Jay Conway in particular seems determined to be upping the ante of what we can conceive of as a free climb at Cathedral Ledge, in NH, alone. I’m definitely still psyched to see who manages to repeat Jumbo Love – and if Jumbo Pumping Love ever goes down that would be incredibly epic. No doubt the Dawn Wall, too, will ultimately come to bear one of these lofty grades.